We who chose to live here in the North Country are a hardy breed. You can see signs of this all around you. The cows have thicker hides, the trees have thicker bark and the lakes sometimes gets real hard…hard enough to walk on. Some extra hardy types actually put little wooden huts or tents on the lakes and fish through the two-foot layer of ice. And, they do this starting in late September. I have seen, with my own eyes, odd vehicles that don’t have wheels to move through the snow. They have treads of some kind and the engines make a whistling noise and the air turns blue. The people who ride around in them wear lots of clothes and all those layers are covered with a heavy one-piece suit. They even have helmets. It looks like a sub-Arctic Area 51. Sometimes it’s so cold that if a guy were to go tee-tee in the woods, the tee-tee will freeze before it hits the ground. Actually, that’s not true. There is no ground…there is about three feet of snow and ice beneath your frozen feet. And this happens no matter much you paid L.L. Bean for those fleece-lined, thinsulated, wool and felt-lined boots. So, if you’re thinking of moving to the North Country, be advised that no matter what size home you buy, you will need to pay a guy named Bear to build an extra room just to hold your winter clothing, skis, snowshoes, mucklucks, and fleece gloves. Don’t worry about the extra room in the summer…there really isn’t one. There is a window of about 16 days where it’s not snowing or raining…and that is sometime in August (that would be the 14th to the 29th, to be exact). We discover that something is wrong with the oil burner. Not only am I hardy, but I’m smart. It only took me about an hour to realize that the lack of heat was due to something being wrong with our oil burner. Being hardy means being far-sighted. Several years ago we had a wood-burner stove installed in our family room downstairs. So, I lit a fire. Isn’t it good? As sure as flapjacks are good…the room downstairs got warm. And it got even warmer until the little thermometer (digital/Radio Shack) said 88 F. Now, I tend to be chilly a lot in these later years of my life, but 88 was a bit much. Especially when I had no idea where any clothing not made of fleece or wool happened to be stored. So, I watched the fire from the other side of the room. I used my birding spotter scope to check on when a new log needed to be added. By now it was near the dinner hour. For some reason I didn’t feel like my pre-dinner dish of Ben & Jerry’s Cherry Garcia. But it was my turn to cook. So, I went up stairs to the kitchen and planned dinner. Something quick and easy. I decided on a stir-fry. I like to have a nice glass of Chardonnay while I cook, so I took the bottle out of the fridge and put it on the counter so it would cool down a little. I prepared the carrots, mushrooms, peppers and rice. I mixed the soy sauce and put aside 1/4 cup of peanuts and scallions for the garnish. 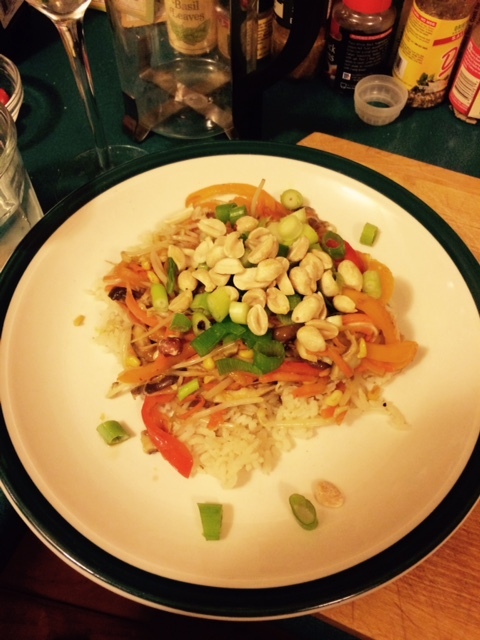 I knew that stir-frying can sometimes be splattery, I put on my special North Country L.L. 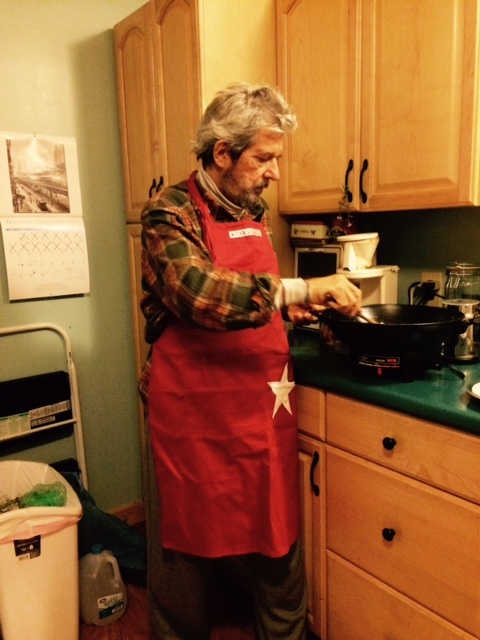 Bean endorsed red apron from Macy’s. It was lined with fleece. I then put the silverware and plates in the microwave to add a touch of warmth, and cooked. It turned out to be a great meal. But, we only have TV upstairs so we bundled up in fleece and wool while we ate and watched Episode 6 of Season 3 of Game of Thrones. This entry was posted in Everyday Events, Food, humor, North Country Life and tagged broken oil burner, cold, cooking, frost, ice, L.L.Bean, north country, snow, stir-fry, winter. Not funny, but I did laugh! Did not know about furnace problem . Might have to put auto generator on the wish list!